idoo file encryption free is the super best folder encryption software, this powerful and useful scure folder encryption tool can help you quickly and safely lock and hide folder ,and it can use 256-bit AES encryption to encrypt your folder located on HDD drive Features and Benefits: Hide file :idoo File Encryption free ultility can hide your private folder in folders and drives to make them completely invisible to users and programs. Lock Data file: The locked folder are protected from accessing, users can not open, read, modify, move, delete, copy, rename the protected folder without password. Protect Data:The write-protected folder are protected from editing, users can not modify, delete, rename the protected folder without password. Files and sub-folders in a protected are also write-protected. Password Protected: idoo File Encryption free program is a password-protect software,that is to say,there's no other way to run or unstall it if you have not the password. Integration with Windows Shell. Hardware and System : Hardware : Compatible Fully support IntelÂ® Pentium D Dual-Core Processor and AMD Athlon? 64X2 Dual-CoreProcessor; System : Windows 2000/2003/XP/Vista/Windows 7 (32&64) protection . 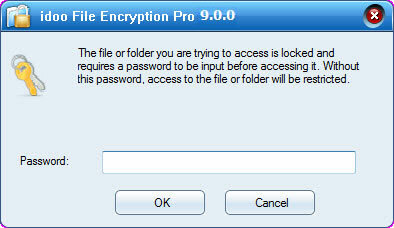 As the most poweful folder data encryption tool,this application can encrypt most formats of windows folder ,for example,Microsoft Office documents (MS Word .doc and .docx file folder ,MS Excel .xls folder ,MS Powerpoint .ppt files,MS outlook pst email files,BMP images,JPG/JPEG photos,GIF picture files,TIFF photo files,PNG picture folder ,Lotus office notes & files,pdf files,mp4 videos,avi video folder ,3gp files,mp3 music,RMVB movies,RM films,winrar zip files) by password protect folders . FileStream Secure Disk is the perfect solution for protecting sensitive information from theft and other attacks. This program makes a part or all of your hard disk, or removable drive, into a secure vault, which can only be accessed with permission. yaSSL is an SSL/TLS Library for programmers building embedded security functionality into their applications and devices. yaSSL employs the dual licensing model, like MySQL, so it is available under GPL and commercial licenses. This site does not contain serial number, crack, keygen idoo File Encryption Pro serial number : serial number is the simplest type of crack. A serial number(cdkey,product key,etc) is register the program as you may already know. a crack or keygen may contain harmful software. If you cannot find the exact version you want, just give it a try. for more information read .nfo/.txt/.diz file include in zipped file.